A head-on shot of the Vari-prop installed on N77Q. This picture clearly shows the hub configuration, as well as the fact that the propeller is spaced ahead further. .....Over 45 Quickies have made first flights. Seven Quickies have been using Mojave as a home base for flying. From the phone calls and letters that we have been receiving at QAC from our builders, it is evident that at least that many more will be flying before the end of the year. .....The average time to build has been about 9 months, with the range all the way from 3.5 months to 14 months. .....Weights for equipped aircraft have ranged from 249 lb. to over 300 lb. .....Incidentally, in many cases, the prettier aircraft are also the lighter ones. .....Since the last newsletter, we have received information on three Quickie incidents. Two of the three occurred on early test flights, when the pilots left the vicinity of their home airport, and landed off airport. One was due to fuel contamination (see Newsletter 8, âFlight Testing Your New Quickieâ) and the preliminary report on the second one from the FAA is that airflow to the carburetor had been restricted by improper installation of the cowling, which caused a partial power reduction. The third incident resulted from an unexpected first flight during taxi testing followed by damage during the first landing. .....Every one of these incidents could have been avoided by more careful preparation. Remember, as a builder you have spent many long hours building your aircraft. Isnât it worth a little additional effort to assure its success for years to come? 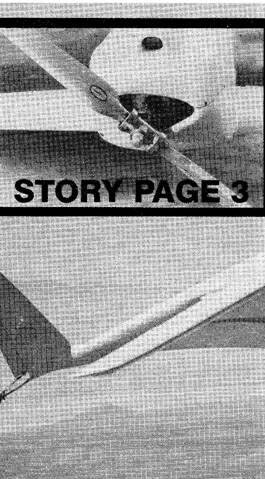 .....Previous newsletters have had pictures of the âNoonerâ Quickie, which used the Mojave airport for much of its early flying.